Desiccants are used as a dehumidifier to control moisture in contained environments, including pharmaceuticals, medical, diagnostics, food, electronics, and optical industries. Clay Desiccant Packets are made of an aluminosilicate clay compound which is a natural mineral and is more economical than silica gel. At 20% RH, Desi Pak will adsorb 50% more moisture than required by Mil-D-3464E, where as silica gel will only adsorb 3.5% more moisture than required by Mil-D-3464E. The chart under the pricing is used to estimate the number of Desiccant Packets required for moisture protection. Bentonite dessicants are all natural, effectivly absorb moisture in packaging to prevent damaging effects such as corrosion, mold and degradation. The production of clay desiccants have less impact on the environment as no harsh chemicals are used during production and mine sites are recultivated and renaturalized. How much desiccant do I need? What is desiccant and what does it do? What is a desiccant "unit"? When do I need to include a humidity indicator card in my package? How does a desiccant most effectively protect my product or package? What size bags, packets, and canisters are available? What industries and products use desiccant? Example: 10" x 10" in. ClearZip Bag. Use our Desiccant Calculator table to determine the amount of desiccant for your application. What product is being protected? What type of container/packaging is being used and how well is it sealed? What is the total amount of time (including packing, shipping, and storage) for which you need protection? Is the product sealed in a separate polybag (plastic bag) within the container/packaging? What are the approximate environmental conditions (temperature and relative humidity %) during the time for which you need protection? A Desiccant is a substance that removes moisture from the surrounding air. When sealed in an air-tight container, such as a plastic bag, a Desiccant Packet will produce a low humidity environment within the Poly Bags and Poly Liners . How to Use Desiccant Packets? Place your item into an Anti-static Bags & Static Shielding bags, Plastic Reclosable Bags - Resealable Plastic Bag or Cellophane Bags and insert the Desiccant Packets. Seal the bag immediately. The silica gel will remove moisture from air within the package. How to Store Desiccant Packs? Unused desiccant packs should be stored in an air-tight container. To preserve their effectiveness they should be kept in the case until immediately before use. How Long Do the Desiccant Packets Last? For best results replace the Desiccant Packets often or if they are exposed to air for an extended time. Between uses seal the empty case with your Desiccant Packet inside. That will preserve the unused Desiccant Packets for future use. Protect foods and medicines like popcorn, candy, pills, vitamins. Protect important documents inside safes and lock boxes. Protect musical and camera equipment, electronics, leather, rubber, copper, etc. For moisture protection of foods, medicines and exposed electronic components, we recommend white sulfur-free Tyvek® Desiccant Packets. 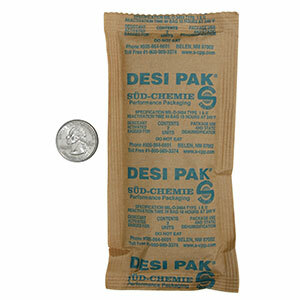 Tyvek Desiccants are sold in same pail and drum sizes as Brown Kraft Desiccants. Products vulnerable to moisture damage need special protection during storage and transport to ensure that they remain effective. Desiccant Packets provide a simple, dependable and economical solution for preventing moisture damage in small, sealed packages. A popular Desiccant Packets configuration in the pharmaceutical industry, Desiccant Packets are also ideal for protecting nutraceuticals, diagnostics, electronics and food In addition to protecting products from moisture. Clay desiccants are non-hazardous, moisture adsorbent substances created by the controlled drying of a calcium (bentonite) aluminosilicate clay. This naturally occurring montmorillonite clay has a special affinity for moisture and is chemically inert and non-corrosive. The layered structure of clay desiccant attracts and adsorbs moisture onto its surface and between its layers. Clay is the least expensive of all desiccants and highly effective within normal temperature and relative humidity ranges. 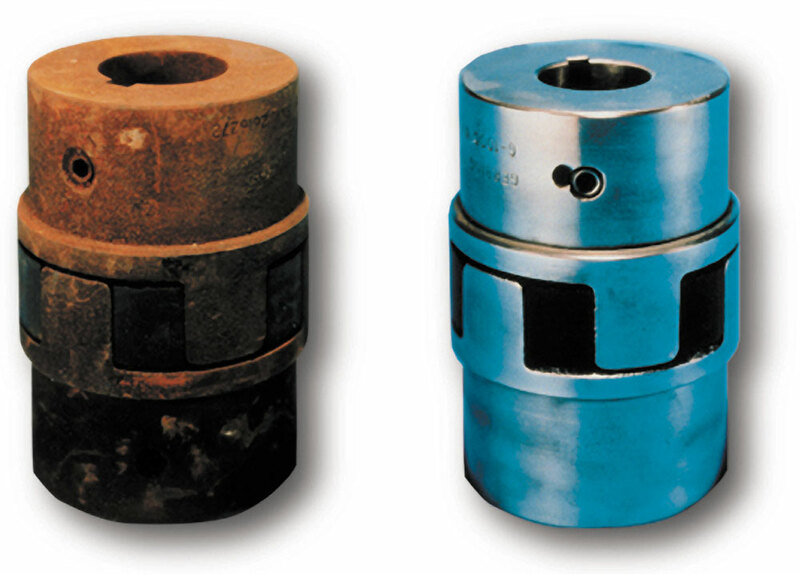 It is used in most industrial applications requiring humidity control. Clay desiccant can adsorb up to 28% of its weight in water vapor at 77°F (25°C) and 80% relative humidity. 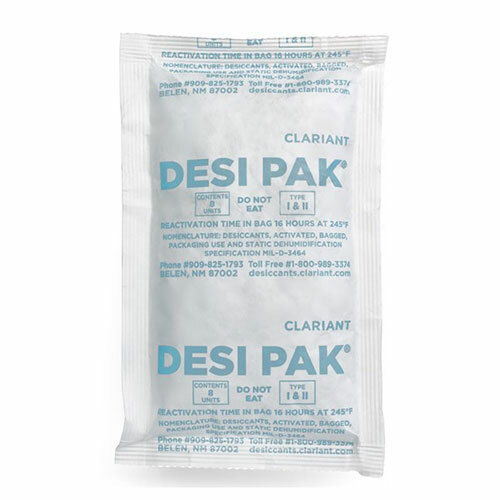 At full moisture vapor capacity, Desi Pak remains dry and free-flowing. There is no apparent change in size, shape, or texture of the desiccant. Clay desiccant works satisfactorily below 120°F (49°C). Above 120°F (49°C), there is a possibility that the clay will give up moisture rather than pull it in (silica gel or molecular sieve are suitable for such temperatures). Accordingly, anticipated storage and transportation conditions should be considered when deciding whether or not to use clay. Silica gel is silicon dioxide (SiO2), an amorphous form of silica which is manufactured from sodium silicate and sulfuric acid. It is a naturally occurring mineral that is purified and processed into beaded or granular form. Like clay desiccant, silica gel is also non-corrosive and chemically inert. Much like a sponge, silica gel's interconnected pores form a vast surface area that will attract and hold water by adsorption and capillary condensation, allowing silica gel to adsorb about 40% of its weight in water vapor at 100% humidity. Indicating silica gel is a bead or granule that has been washed with a concentration of cobalt chloride (a heavy metal salt). The cobalt chloride is a deep blue color when dry and turns from blue to purple to pink as it becomes saturated with moisture. Another use of indicating silica gel is with a moisture sensitive product that will be inspected regularly, as the indicating silica gel gives a quick visual indication of how well the product is doing. Due to the presence of cobalt chloride, indicating silica gel desiccant should never be used in contact with products for consumption, such as food or pharmaceuticals. Indicating silica gel desiccant is also available in special packet sizes for use in electronics, pharmaceutical, or food packaging. Molecular sieve is a synthetically produced crystalline metal alumosilicate zeolite. Molecular sieve particles have a uniform pore structure (created during the manufacturing process). This enables molecular sieve to separate molecules by size. It is also non-hazardous and derived from naturally occurring materials. Molecular sieve is the desiccant of choice for the most demanding and unique applications. The pore structure of molecular sieve desiccant provides a higher capacity for water adsorption than either silica gel or clay at very low humidity levels. Molecular sieve also retains a higher percentage of moisture capacity at elevated temperatures; in fact, molecular sieve can hold moisture at temperatures well past 450°F (232°C). Because of its high affinity for moisture, molecular sieve is able to bring the relative humidity in packages down as low as 10% relative humidity. The most commonly used pore size for drying applications is 4 angstroms (4A). Molecular sieve desiccant is also available in 3 angstroms (3A), 5 angstroms (5A) and 10 angstroms (13X) sizes for specific molecule separation, including gases. Molecular sieve is the most aggressive of the primary desiccants (in terms of adsorption rate), so additional handling procedures may need to be considered. In desiccant terminology, a "unit" is the quantity of desiccant required to meet the U.S. Military's specification (MIL-D-3464E) for packaged desiccant products. Under this specification, a unit is the quantity of desiccant which will adsorb 3.00 grams of water vapor at 20% relative humidity or 6.00 grams of water vapor at 40% relative humidity at 77°F (25°C). if the barrier material (i.e., plastic bag) you use to package your product has a high moisture vapor transmission rate (which means that a significant amount of humid air is entering your package through the barrier material itself). How does desiccant most effectively protect my product or package? In order to achieve optimal protection, desiccants should be used within a closed/sealed moisture barrier or a rigid/sealed container. Humidity Indicator Cards are generally placed inside the container to show the humidity level and to indicate when the desiccant needs to be replaced. Standard sizes for unit bags are as follows: 1/6, 1/3, 1/2, 1, 2, 4, 8, 16, and 80 units. A unit is roughly one ounce of desiccant material. Standard sizes for packets are as follows: 1/4, 1/2, 1, 2, 3, 5, and 10 grams. Standard sizes for canisters are as follows: 1/2, 1, 2, and 3 grams. Custom sizes are available to fit your packaging needs, though such sizes typically carry a significant minimum order quantity. Desiccants in bags are commonly referred to as industrial desiccants. They are primarily used by industry because their medium to large size enables them to adsorb moisture in heavy duty applications. 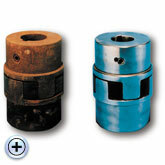 However, these bags are commonly used in non-industrial applications as well. The term "bagged" desiccants commonly refers to any desiccant which is packaged by the unit. Desiccants in packets or canisters are commonly referred to as pharmaceutical desiccants. They are primarily used by the pharmaceutical industry because of their small size. However, other industries, such as electronics, optics, and food packaging utilize these packets and canisters as well. When International Plastics receives a call from a customer looking for a desiccant, our sales reps will help calculate which type and size of desiccant will work best for the particular application. To determine the number of "units" required to protect medium to large products/packages/areas, refer to the Desiccant Requirements Chart Unit Sizes. To determine the number of "grams" required to protect small products/packages/areas, refer to the Desiccant Requirements Chart Gram Sizes. It is important to contact your International Plastic's Sales Representative to discuss your specific application.